This 2-story 1690 sq. ft. townhome was built in 2012, and is equipped with central air. The first floor has an open floor plan with a living area, dining area with a table that expands to seat 10, kitchen, half bath, gas fireplace, and, washer/dryer. The living room opens to a pleasant deck with a natural gas grill and a bistro table. Both the living area and the master bedroom have a 55” HDTV with Dish Satellite. The kitchen is fully equipped with cookware, dinnerware, gas range, coffee maker, toaster, and blender. The second floor has 2 bedrooms. The spacious master bedroom has a king size bed, ensuite bath and walk in closet. The second bedroom is furnished with a queen size bed and there is a second bathroom accessible through the hall. There is a queen size elevated airbed with a built in pump available that can be used either in the master bedroom or the living room for additional sleeping space. There is off street parking in the driveway. The unit is close to Multmomah Village (5 minute drive or 15 minute walk) and Hillsdale with restaurants, shops, and bakeries. It is a short walk to public transportation and grocery stores and about a 10 minute drive to downtown Portland. It is close to Custer Park and Gabriel Park. We purchased this property to be close to our grandchildren when we visit. We would like to share it with visitors to Portland who would like a comfortable place to stay in a convenient location. 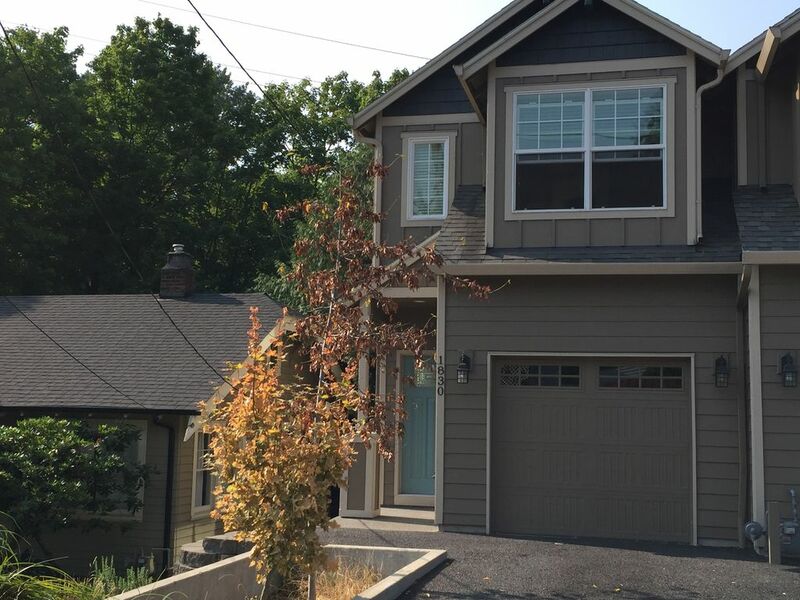 Roomy well equipped townhome that is convenient to Portland neighborhoods and attractions. 2 full bathrooms upstairs and a half bath on the first floor. Generally the table is set up to seat 4 to 6 but, can expand to seat 10 comfortably. Two 55 inch HDTV with Dish Satellite. One in living room and one in master bedroom. The home is lovely and in a convenient area. My husband and I stayed in this lovely town home for 6 nights and it was a pleasure. We were very comfortable and had everything we needed. The host/ owner Deborah is wonderful! We will definitely want to stay here again when we visit our family in Portland. It was nice to have you as guests. Come back anytime. We used this as our home base for a business trip and it was perfect. We were a little worried about being next to a busy road, but found the home to be quiet enough for sleeping. Proximity to both Fred Meyer and Safeway was a bonus. We didn't get a chance to hike up the hill and see where the trail went... but next time! We'll definitely book this home again. We regularly visit family in Portland, and found this property to be the perfect alternative to a hotel. It was very clean; newer; had a well-equipped kitchen; wifi and tvs; and, conveniently located in the middle of the 3 different Portland suburbs we needed to visit. Despite the proximity to a major road and the highway, we found it to be extremely quiet and secure. While the area isn't especially walkable with kids, there are nearby running trails and you can walk to a grocery store and coffee shop. The owner and person who cleans were super helpful. We will be back! Thanks, Jean. You are terrific guests and are welcome back any time. Happy New Year! This house is perfectly located, exceptionally clean and has everything one can need and more. I had some issues with the WiFi and the owner worked diligently to satisfactorily address the issue. The beds are very comfortable and the house is move in ready. There were 4 adults in the house and it was a pleasure to have the sleeping, living and bathroom space needed. I wholeheartedly recommend this house. I look forward to a return visit! It was a pleasure having you as guests. Please think of us next time you visit Portland.